UPDATE 3:05 P.M. The missing helicopter has been located, details are pending release by the Grand County Sheriff’s Office. ST. GEORGE – The Grand County Sheriff’s Office and the Department of Public Safety are currently searching for a helicopter and its two occupants reported overdue on Sunday. The helicopter and occupants left the area of Green River, Sunday, at approximately 11:15 a.m. to search for elk antler sheds, according to a statement released by the Sheriff’s Office. The helicopter was reported overdue at approximately 8 p.m. The Department of Public Safety was contacted at that time and is using its helicopter to assist in the search. The DPS helicopter flew Sunday evening using their FLIR – forward looking infrared – to aid in the search. The search went until approximately midnight and resumed again Monday morning. The surrounding counties have been contacted and airports checked in those counties to determine if that aircraft may have landed within those jurisdictions, the Sheriff’s Office reported. As of 1:30 p.m., Monday, the helicopter has not been found. Further, the Sheriff’s Office statement said the pinging of occupants’ cell phones has thus far been unproductive. “We have lots of people, lots of people who have got up in the air,” a family member of one of the occupants told St. George News. 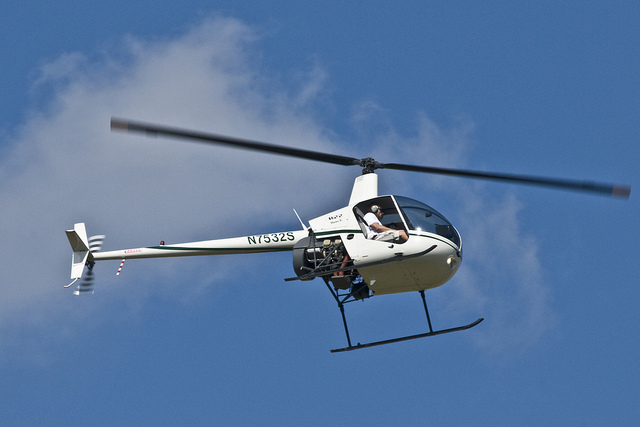 A photo included in this report is provided courtesy of the Sheriff’s Office for reference purposes only and does not depict the actual helicopter. “It’s just an R-22, that’s the description,” the family member said. Grand County Sheriff’s Office has not released names of the helicopter occupants. Respecting the privacy of family and those who may not yet be notified, St. George News is deferring use of names in this report. Anyone with information on this aircraft is asked to contact the Grand County Sheriff’s Office 435-259-8115.